Attention all high school and college students! 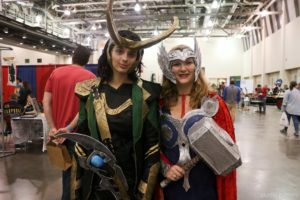 The Grand Rapids Comic-Con is always looking for teenagers and college students to help us spread the word through being a street team member! All we ask you to do is pass out flyers at your school, put up some posters in your community (with permission–no guerrilla marketing! ), and drag your friends to the show. If you are interested please contact Mark Hodges at mark@grcomiccon.com and he will hook you up. Please put “Street Team” in the subject matter and include your name, address, phone number, email address, the school you attend, and the amount of postcards you would like to have. We will mail them out pronto!